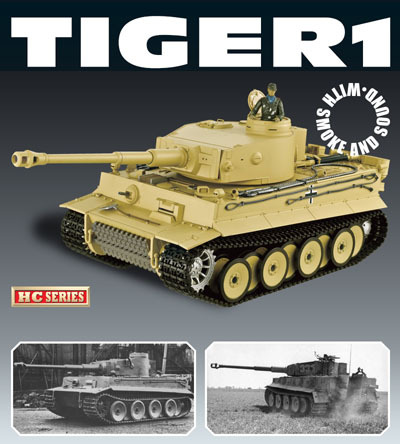 1/16 Taigen IR Tiger I RC Tank, Early version Discounts Apply ! TAG12011 - 1/16 Taigen IR Tiger I RC Tank Early version, Desert Tan. This Taigen RC Tank comes with a metal lower chassis, metal gearboxes, metal gun barrel, 2.4 GHz radio, battery and wall charger. Tank has sound, cannon recoil and painted figure. Free: IR Unit (Infrared Receiver) Included with every Taigen tank we sell. Fits on top of turret for two or more tank battling. Please Note: Tiagen IR units are only compatible with other Taigen IR tanks. Main board cooling fan included with all our Taigen tanks. This helps keep main electronics board cool when in use. The main board is also enclosed in it's own box to help keep dirt out. Enclosed speaker box for better sound quality and to help keep dirt out. 2.4GHz radio and receiver, no crystals needed. Smoke Unit Included with Smoke Oil. Each tank includes a painted tank commander and accessories.